For the San Francisco station at 910 AM formerly known as KNEW, see KKSF (AM). "San Francisco: Financial & Business News"
KNEW (960 AM) is an American business talk radio station licensed to Oakland, California, which serves the San Francisco Bay Area. The station is owned by iHeartMedia, Inc. The station's studios are located in SoMa district of San Francisco, and the transmitter is located in Oakland at the eastern end of the San Francisco-Oakland Bay Bridge. KNEW can also be heard in the HD format. KABL began in Oakland as KFWM under the ownership of the Oakland Educational Society on July 8, 1925. The Oakland Post-Enquirer wanted a radio station to compete with the Oakland Tribune's KLX. This station became KROW in June 1930, and used those call letters until 1959. It was a full-service station known for launching the career of comedian Phyllis Diller and for helping the career of "the world's greatest disc jockey" Don Sherwood, prior to his great career at KSFO. In 1947, the station built a new transmitter on a 20-acre island leased from the Port of Oakland. The new transmitter was accompanied by an increase in power from 1 KW to 5 KW full-time. This station is best known as the longtime home of KABL, the successor to KROW and one of the first beautiful music stations in the United States, owned by 1950s radio pioneer Gordon McLendon. According to longtime McLendon national program director, Don Keyes (d. 2006), in his book Gordon McLendon and Me, McLendon wanted to own a station in the San Francisco market, and 960 KROW seemed ideal because of its relatively low dial position and strong coverage of the San Francisco market. The original plan had been to launch a Top 40 format on KROW, but after McLendon and his team visited the market and discovered there were already several Top 40 stations, they decided there wasn't room for another one. As a result, they looked to KIXL, a beautiful-music station in the Dallas-Fort Worth, Texas, market that was enjoying a fair amount of success despite being daytime-only, and decided to launch a similar format on KROW using KIXL's formula of quarter-hour blocks of familiar musical selections (three instrumentals, arranged by tempo, and one vocal) as a template. The new calls were to be KABL, as in San Francisco's legendary cable cars. In early May 1959, KROW began "stunting" with a continuous loop of a song called "Gila Monster," the theme song from a horror film that Gordon McLendon had co-produced that year. Based on this stunt, it was assumed by the general public — and by the competition — that KROW was to become a Top 40 station along the lines of McLendon's KLIF in Dallas, WAKY in Louisville or KILT in Houston, but the station then proceeded to take everyone by surprise by debuting KABL as a beautiful music station. KABL quickly captured the erudite listening audience that disliked rock and roll and soon became the number one radio station in San Francisco, and would remain at or near the top of the ratings for years afterward. As KABL, the station combined a mixture of easy listening string and orchestra music with light classics and an occasional Latin cocktail hour tune. KABL was known for presenting poetic vignettes about San Francisco life, a harp interlude between songs, and a cable car bell to announce the news. Licensed to Oakland, with a transmitter near the east end of the San Francisco–Oakland Bay Bridge, KABL was also noted in radio history for its failure to properly identify its city of license. While KABL could have legally identified as "Oakland/San Francisco," it instead deliberately tried to identify with San Francisco rather than Oakland. It was notorious for using slogans such as "KABL Oakland, serving San Francisco on your San Francisco radio dial, in the air, everywhere over San Francisco". This raised the ire of the Federal Communications Commission (FCC), resulting in a fine and an admonishment to all broadcasters that they were licensed to serve a particular community, not surrounding ones. In 1997, the station switched to an adult standards format of traditional pop and big band music. At one point, presumably inspired by the "swing dancing/zoot suits" craze of the late 1990s, they added a nightly "swing/dance" show several hours in length, which played music by the retro swing groups of the period such as Brian Setzer's and the Cherry Poppin' Daddies, as well as standard material such as Glenn Miller's "In The Mood". This program didn't last very long. They also carried the syndicated When Radio Was Old-Time Radio anthology series, tending to move its time slot around. In 2000, they briefly switched to a 1960s-1970s soft rock format, but went back to older music after complaints from their regular audience. In fact, later-years KABL tended to go back and forth on including greater amounts of more "modern" softer pop-rock material then not identified with "traditional" adult standards - Peter & Gordon and Dusty Springfield from the '60s, even Kenny Rogers and Air Supply from the turn of the '80s. On September 28, 2004, 960 AM dropped the adult standards programming and the KABL call letters. KABL subsequently reemerged at then co-owned 92.1 FM in Walnut Creek, California. The station had a very limited signal beyond its immediate broadcast area, however, and in July 2005, switched to an adult contemporary music format. KABL then began broadcasting as an internet radio station. This lasted until January 31, 2007, when Clear Channel Conmmunications discontinued KABL's streaming music. On June 1, 2007, under license from Clear Channel, the Bay Area Radio Museum launched a streaming tribute to KABL on the Internet, which featured Beautiful Music, Easy Listening, Adult Standards, Big Bands, traditional pop and middle-of-the-road music, to represent the various musical styles presented during the station's forty years on the air. The URL that was used now directs to Clear Channel Corporation's iHeart Radio website. This leaves Radio Sausalito and KCEA as the only two adult standards radio stations in the Bay Area. Replacing KABL on September 28, 2004 were new call letters KQKE and a progressive talk format, branded as "960 The Quake". The Quake's tag lines are "The Bay Area Home of Air America", "Talk Radio for the Rest of Us" and "Talk Radio from the Left". The station carried a mix of Dial Global programs, such as Ed Schultz, Stephanie Miller and Thom Hartmann, and other distributors. At one time it also carried programs from the now-defunct Air America network. The station also aired some local weekend programming. One weekend show, Shake!, aired on Sunday nights and was targeted toward the Bay Area's gay and lesbian community. The show also aired on co-owned KLSD in San Diego until November 2007. In 2006, KQKE introduced a local morning show featuring political satirist Will Durst and former San Francisco mayor Willie Brown. Keeping it Real with Will and Willie aired from 7 a.m. to 10 a.m. Monday through Friday. The show was canceled, and aired its final regular broadcast on September 29, 2006. At that time, the program director indicated that "the pair will still do special broadcasts and appearances for the station." John Scott was hired as AM operations manager for both KQKE and KNEW in 2007, and introduced new shows and elements into the programming mix. He would be the last local manager of the stations, with those duties now handled by Clear Channel corporate. In 2009, the station introduced another weekend program, An Organic Conversation, airing Saturdays at 10am PST. Presented by Helge Hellberg, executive director of Marin Organic, and Mark Mulcahy, organic produce consultant, An Organic Conversation features ecology-based thinking and insight into the organic food and holistic health movement. The Progressive News Hour with John Scott once aired weekdays from 6 a.m. to 7 a.m., leading into Keeping it Real with Will and Willie and was a rundown of local and national news, as well as weather and traffic reports. Shortly after Will and Willie disappeared, Stephanie Miller's morning show arrived to take the 6 a.m. to 9 a.m. slot on KQKE. The remodeled show The Progressive News then moved to 4-6PM, and its content was more focused on the Bay Area, including more interviews and news about Bay Area people and politics, with less repetition of national stories. "AM 960 The Quake" was not related to KQAK, a San Francisco station that was on the air from 1982 to 1985 that also called itself "The Quake". However, Paul "Lobster" Wells holds the distinction of working for both "Quake" stations, as he served as producer and on-air contributor for KQKE's former morning show. On August 13, 2007, Clear Channel changed the KQKE call sign to KKGN, with a repositioning as "Green 960" and initially with programming focused on environmental issues. On January 3, 2012, Clear Channel management changed KKGN to KNEW and shifted to a wider-based talk format. The move was part of a broader restructuring of talk programming in Clear Channel's San Francisco cluster. While still predominantly progressive talk for most of the day, KNEW also carried the decidedly conservative Glenn Beck Program during morning drive as well as The Dave Ramsey Show in middays. On January 2, 2014, Rush Limbaugh's daily syndicated program moved from KKSF to KNEW. At this point, KNEW dropped all progressive talk programs, as it flipped to conservative talk and rebranded as "The Patriot". On September 29, 2014, KNEW dropped conservative talk for business talk programming provided by New York City-based Bloomberg Radio. Limbaugh, Beck, and Hannity's programs were moved to KSFO. ^ KABL 960, Oakland - Bay Area Radio Museum "KABL, which went on the air from Oakland as KFWM under the ownership of the Oakland Educational Society on July 8, 1925, became KROW in June 1930. In 1939, the station was sold to the owners of San Francisco’s KTAB, who, in turn, were required to sell it in 1944 as a result of the FCC’s “Duopoly” edict, which forbade ownership of more than one station in a market area. On December 19, 1944, Sheldon F. Sackett, publisher of the Oakland-based Olympic Press weekly newspaper, bought KROW for $250,000 and continued operating it until May 1959." ^ Lippman, Leopold (February 23, 1958). "Some Radio Call Letters With a Message". The New York Times. Dog lovers can hear the familiar WOOF in Dothan, Ala., and bird-watchers look to Topeka, Kan., for a WREN, or to Oakland, Calif., for a KROW. ^ "KROW Island is site of New 250-ft Towers" (PDF). Broadcasting. October 20, 1947. Retrieved 15 October 2014. ^ Fost, Dan (September 25, 2004). "Liberal talk radio arrives". San Francisco Chronicle. pp. C1. ^ Fong-Torres, Ben (September 23, 2007). "Radio waves". San Francisco Chronicle. pp. N-56. ^ "LTR - Watching Alternative Media for Five Years: The 'greening' of The Quake, part 2". Ltradio.blogspot.com. 2007-08-22. Retrieved 2010-02-27. ^ "AM Query Results - Audio Division (FCC) USA". Fcc.gov. Retrieved 2010-02-27. ^ Bond, Paul (5 December 2013). "Rush Limbaugh to Switch Stations in Los Angeles and San Francisco". Hollywood Reporter. ^ Faughnder, Ryan (December 5, 2013). "Clear Channel moving Rush Limbaugh from KFI to revamped KTLK". Los Angeles Times. ^ "Talk 910 - San Francisco's Talk Station". Talk 910. ^ Scott Fybush. "Bloomberg Radio To Debut On 960 KNEW San Francisco". RadioInsight. ^ Nathan Obral. "Limbaugh, Hannity, & Beck Move To KSFO San Francisco". RadioInsight. 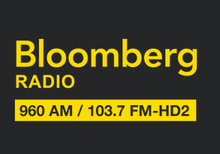 ^ "Bloomberg Radio To Debut On 960 KNEW San Francisco". RadioInsight. 23 September 2014. Retrieved 20 January 2015.